The University of Manchester is a university located in Manchester, England. With over 40,000 students studying 500 academic programmes, more than 10,000 staff and an annual income of nearly £600 million it is the largest single-site University in the United Kingdom and receives more applications from prospective students than any other university in the country, with more than 60,000 applications for undergraduate courses alone. According to the The Sunday Times, "Manchester has a formidable reputation spanning most disciplines, but most notably in the life sciences, engineering, humanities, economics, sociology and the social sciences". The present University was formed in 2004 by the dissolution of the Victoria University of Manchester (which was commonly known as the University of Manchester) and UMIST (University of Manchester Institute of Science and Technology) and the subsequent formation of a single institution. 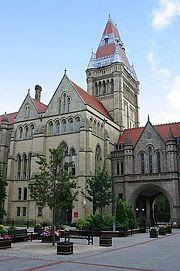 The University of Manchester is a member of the Russell Group and was named University of the Year 2006. This followed the awarding by the inaugural Times Higher Education Supplement's University of the Year prize in 2005. While the present University was formed in 2004, its constituent parts date from as early as 1824. The University's history is closely linked to Manchester's emergence as the world's first industrial city. John Dalton together with Manchester businessmen and industrialists established the Mechanics' Institute (later to become UMIST) in 1824 to ensure that workers could learn the basic principles of science. Similarly, John Owens, a Manchester textile merchant, left a bequest of £96,942 in 1851 for the purpose of founding a college for the education of males on non-sectarian lines. 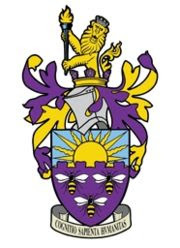 Owens College (to become the Victoria University of Manchester) was established and granted a Royal Charter in 1880 to become England's first civic university. It was initially housed in a building, complete with Adams staircase, on the corner of Quay Street and Byron Street which had been the home of the philanthropist Richard Cobden, and subsequently was to house Manchester County Court. By 1905 the two institutions were a large and active force in the area, with the Mechanics' Institute, the forerunner of the modern UMIST, forming a Faculty of Technology and working alongside the Victoria University of Manchester. Before the merger, the Universities between them counted 23 Nobel Prize winners amongst their former staff and students. Manchester has traditionally been particularly strong in the sciences, with the nuclear nature of the atom being discovered at Manchester, and the world's first programmable electronic computer coming into being in the city. Famous scientists associated with the university including the physicists John Dalton, Niels Bohr, Ernest Rutherford, James Chadwick, Arthur Schuster, Hans Geiger, Ernest Marsden and Balfour Stewart. 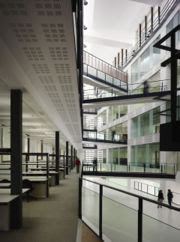 However, the university has also contributed in many other fields, and the mathematicians Paul Erdős and Alan Turing, the author Anthony Burgess, philosophers Ludwig Wittgenstein and Alasdair MacIntyre, the Pritzker Prize and RIBA Stirling Prize winning architect Norman Foster and the composer Peter Maxwell Davies all attended, or worked in, Manchester. Well-known figures among the current academic staff include author Martin Amis, computer scientist Steve Furber, literary critic Terry Eagleton. This followed the awarding by the inaugural Times Higher Supplement's University of the Year prize in 2005.The Academic Ranking of World Universities 2007 published by the Institute of Higher Education of Shanghai Jiao Tong University ranked Manchester 5th in the UK, 9th in Europe and 48th in the world. According to High Fliers Research Limited's survey, 'The Graduate Market in 2007', University of Manchester students are being targeted by more top recruiters for 2007 graduate vacancies than any other UK university students. Manchester has the largest total income of all UK universities, standing at £590 million as of 2005 but its deficit for the 2005/6 financial year stands at £20.6 million.. Some 750 posts will go, with 1100 staff applying for redundancy.Its research income of £200 million is the fifth largest of any university in the country. Faculty of Medical and Human Sciences consisting of the Schools of Medicine; Dentistry; Nursing, Midwifery and Social Work; Pharmacy and Pharmaceutical Sciences; and Psychological Sciences. Faculty of Engineering and Physical Sciences consisting of the Schools of Chemical Engineering and Analytical Science; Chemistry; Computer Science; Earth, Atmospheric and Environmental Science; Physics and Astronomy; Electrical & Electronic Engineering; Materials; Mathematics; and Mechanical, Aerospace and Civil Engineering. Faculty of Humanities includes the School of Arts, Histories and Cultures (a rather catchall title incorporating Archaeology; Art History; Classics and Ancient History; Drama; English and American Studies; History; Music; and Religions and Theology). The other Schools are Education; Environment and Development; Architecture; Informatics (formed from the UMIST Department of Computation); Languages, Linguistics and Cultures; Law; Social Sciences and the Manchester Business School. Faculty of Life Sciences unusually consisting of a single school.